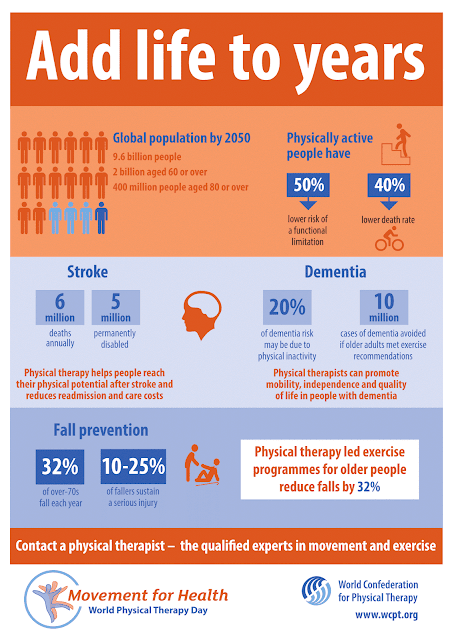 WCPT has launched the toolkit for this year's World Physical Therapy Day, with posters, leaflets and an infographic now available. World Physical Therapy Day takes place on 8th September 2016, and this year WCPT is suggesting that physical therapists around the world publicise their important role in healthy ageing, and “adding life to years”. Each year, World Physical Therapy Day allows therapists to highlight their role as experts in movement and functional mobility. Participants are encouraged to organise events to publicise physical therapy's contribution and cost effectiveness. WCPT is suggesting that individual physical therapists wishing to organise events should contact their National physical therapy organisation so that activities can be linked up. This year's toolkit includes a guidance booklet, stickers, posters and a t-shirt design, as well as a list of resources to support activities including research demonstrating the role of physical therapy in promoting independence. For the first time WCPT has produced an infographic, illustrating physical therapy's importance in helping older people reach their full potential following stroke, dementia and falls. World Physical Therapy Day allows individual therapists and their organisations across the world to celebrate their contribution to global health. This year's event hopes to build on the success of the event in 2015, when the theme was “Fulfilling potential”. Individual therapists, hospital departments and organisations are encouraged to use the toolkit and hashtag #addlifetoyears to show that physical therapy all over the world helps keep people well, mobile and independent.